The squad set to face the U.K will be with one less of their star players after Josh Hazlewood, the bowler with the most experience has been removed from the series that is upcoming. Hazlewood will be replaced by Queensland’s Michael Neser. Hazlewood has been dealing with soreness in his back and as a result, it has been determined that he lumbar spine stress. “Josh has been managing some low level bone stress in his lumbar spine for a short period. He had a repeat scan today and although it has not progressed to a fracture he is starting to experience some lower back pain. Hazlewood, who was a major contributor to last summer’s Queensland’s JLT Sheffield Shield title is known for being a skilful swing bowler and is the leading wicket-taker for the Bulls when they played in JLT One-Day Cup. Nesr is expected to join the Australian squad this week in the United Kingdom. The squad are due to leave on Monday and arrive on Tuesday. 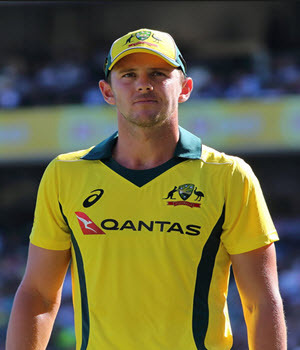 The absence of Josh Hazlewood is a kick to the squad as they are already without two of their fastest bowlers after Pat Cummins and Mitchell Starc announced they would not be participating in the tour. Also missing is David Warner and Steve Smith who are serving out bans after rolls they playing in a tampering scandal in Cape Town. Mitch Marsh will also be absent. After a heavy workload during the summer, one that saw Hazlewood playing in each of the five Ashes Tests, four in South Africa and three out of the fie Gillette ODI’s, the result and stress impacted the soreness in his back. As one of the four original picks for the squad, only one has played more games than Hazlewood, that being Kane Richardson. Hazlewood has an outstanding record internationally, scoring sixty-nine wickets at twenty-four in forty-one games. He is expected to be a member of the squad in next year’s World Cup that is being held in the U.K.